Aluminum Fever. That’s why you’re here – that’s why this website’s here. Below are links to other websites where aged Airstreams are revered and immortalized. To add your website, or a website you come across, please contact us with the link. Also, please let me know of any dead links. Silvaire Arlen & Shirley did a thorough job on their 1964 Globetrotter restoration. Great polishing info, too. Lashway's '56 Bubble Mirror polish using Rolite products. Nice underseat A/C install. Tom Patterson's Pages Airstreams, Streamlines, SilverStreaks, Curtis-Wrights, & the VAList and VAList Archives. Also, a gray-water tank retrofit installation. Be sure to also visit the Photo Gallery of member's trailers. Amanda's '68 Safari Includes photo essay on what happens when forklift and an Airstream meet. Vintage Trailer Park Not one, but three nicely restored Airstream trailers from the '40's & '50s. Funky Junk Farms So. Cal movie prop suppliers and collectors of old vintage trailers & camping "stuff"
SnoMan Blog for european import of a '66 Overlander and touring the Swiss & French Alps - the Grand Alpine Tour. Silver Streak Jet A 1958 Silver Streak, plus Marvel Refrigerator and Princess Stove manual. Pfredd.com Dave Lowrey's site. Nice Solar installation instructions on an Argosy. Atfore Blogging takers a little getting used to (the end of the story comes first). Airstream topic covers replacing the Bowen hot water heater and reusing the old shroud. SerroScotty Source for information of the Serro Scotty line of vintage trailers, plus sources of vintage trailer information and parts. Squob Web Magazine Thinking outside the white box camper.Slick web magazine featuring non-traditional RV's and camping. 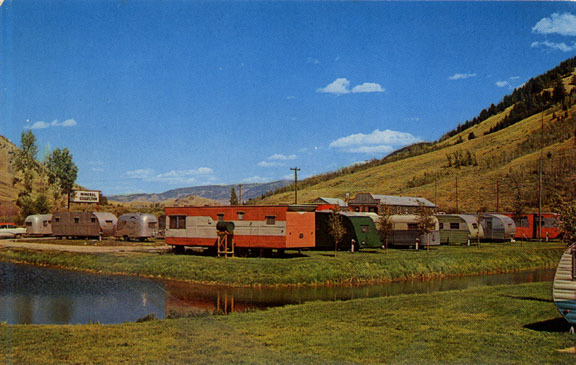 Andrea Hamilton Andrea Blogs about Airstreams & trailer life - updated about once a week. Healthy Homes Vermont rebuilder of Airstreams w/o chemical products. Sells ready to finish shells. UsedAirstream.com Easy link into ebay Airstreams along with other Airstream articles. Vintage Airstream Club The VAC of the WBCCI has a Classifieds section.